The Chichester Priory 10k – one of the major road races in the English road running calendar – takes place on Sunday. This year is the second outing on a new course, starting and finishing at the Goodwood motor circuit, which seemed to be well-received on its debut a year ago. The race starts at 9.30am and takes runners south along Claypit Lane, Madgwick Lane, along Stane Street to Strettington, across to New Road and westwards back to the motor circuit, with a complete lap of the circuit to finish. The 2017 event suffered from traffic management problems and parking issues but organisers have implemented measures to ensure these are not repeated. There are additional entrances to the circuit and a reduction in the number of race entries accepted, down to 1,800. Competitors are still advised to get there early to help alleviate hold-ups. The success of the 26 previous years’ events means this year’s race is again extremely popular with runners from all over England and Wales expected to compete. Clubs from all over the south will be present and there is added interest for the Sussex runners as the race is again part of the Sussex 10k road race championships and the Harvey Curtis Sussex road race challenge. The event has more than trebled in size since the inaugural race but it remains very varied in terms of competitors. There will be runners representing their clubs, running for charity, looking for personal bests or turning out for the first time. Many runners use it as a pre-London or Brighton Marathon warm-up. The 10k is one of three qualifying opportunities for the Age Groups Masters England 10k. Organisers are working with England Athletics to recognise the achievements of dedicated club runners of veteran categories. Chichester is one of three qualifying events and the leading athletes at Goodwood will secure an England Masters vest for the Great Birmingham 10k on May 6. Meanwhile the local sporting community has been devastated by the news of the very serious illness of Melanie de Lacy. 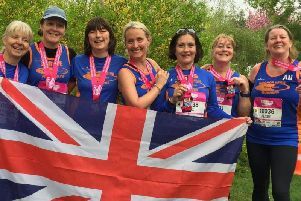 In recognition of her sporting achievements and the work for her cancer charity, a large team of more than 100 runners, made up of her family and friends have entered the race. The team will all wear the same specially-designed and printed T-shirts which have been most generously donated by Mark Ponsford from Krowmark. Melanie will be part of the official race start team and ‘her team’ are asked to ensure they have practised their royal waves to perform as they cross the start line. There is a comprehensive prize list. Prizes for beating last year’s course record of 30min 46sec for men and 35.14 for women will be £100. There are special prizes of £150 for the first male runner who finishes the race in under 30 minutes and for the first female who finishes in less than 33.30. There are two special prizes for local runners. The Chichester Observer-sponsored Ben Steppel Memorial Prize to the first under-23 local man home and the Colin Thorne Memorial Prize goes to the first under-23 local woman finisher. With the new course relatively flat, runners should record fast times and personal bests. The front end of the race could be exciting with at least four ‘in-form’ male athletes who have entered and are capable of being close to sub 30 minutes. No stranger to Chichester is Andy Maud (Highgate Harriers), who won the race a few years ago and has been placed on a number of occasions since. Challengers are likely to be Richard Allen (Aldershot & Farnham), Ross Skelton (Brighton Phoenix), Ben Johnson (Southport Waterloo), Tom Higgs (South London Harriers) and Kojo Kyereme (Shaftesbury Barnet). Allen was well-placed in the recent southern cross-country championships. Other local Sussex runners likely to be challenging for podium places are Paul Navesey and Neil Boniface from Crawley AC, and Maxwell Dumbrell (Brighton Phoenix). Top Chichester Runners include James Baker, Harry Leleu and Chris Bird. The veterans’ race will see leading runners from Sussex competing against those from Kent, Hampshire and further afield as well as hoping to qualify for the national masters championships. Also in this age category are Mark Worringham (Reading Roadrunners), Tim Watson (Bristol & West) and Neil Smith (Crawley). The men’s team event looks to be very competitive with Aldershot, Farnham and District and Brighton Phoenix strong contenders. Entries for the women’s race include a number of internationals, Katrina Wootton of Coventry Godiva, Rebecca Moore of Chichester and Rebecca Murray of Bedford. All these are capable of being close to 34 minutes or under it. There will be strong competition for the veterans’ prizes with many familiar faces returning to Chichester including Kathy Bailey of Winchester AC and Caroline Hoyte of Arena 80 AC. Teams from Winchester, Worthing, Southampton and Arena 80 will be leading contenders in the women’s team event. The race is organised by the Rotary Club of Chichester Priory who raise money for many deserving causes. Over the past 26 years, more than a third of a million pounds has been raised for a variety of charities, in addition to personal sums raised by individual runners for their own charities. There are a number of major sponsors returning this year including local solicitors Wannops LLB, The Run Company and estate agents and agricultural land valuers Henry Adams. Spectators are welcome to watch the race and line the course. The main vantage points will be around Goodwood, especially the start and finish at the motor circuit, but spectators are advised to get there in good time because of road closures in place in the area from 9am. Motorists should avoid the Goodwood, Westerton and Halnaker areas between 9.15am and 10.30am. The 2018 event has reached maximum numbers and entry closed well before the deadline. There will be no entries accepted on the day. Organisers wish all participants an enjoyable and successful run. There will be a good coverage of the race on www.chichester.co.uk on the day and reports, photographs and list of finishers published in the Chichester Observer on 9th February.